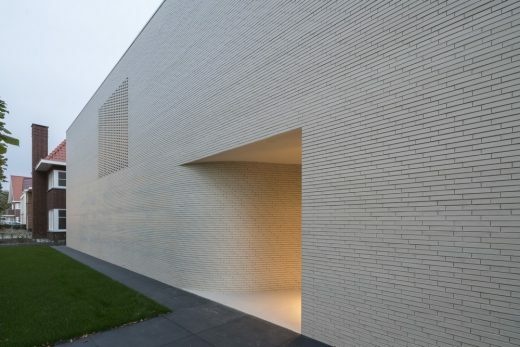 MVRDV recently completed Casa Kwantes, a private residence west of Rotterdam, the Netherlands. 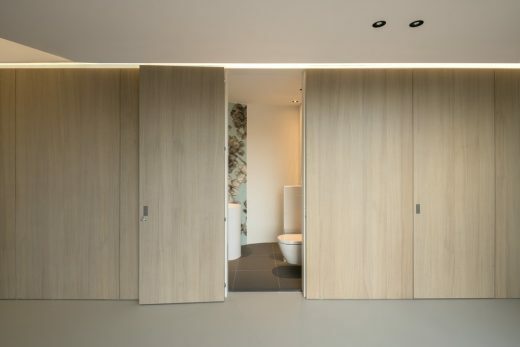 This 480 sqm property gives its residents the privacy they desire whilst at the same time opens up the house towards the garden and daylight. 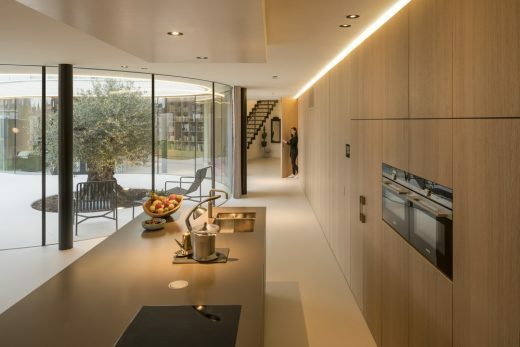 Operating within a nostalgic urban requirement, a wall of 1930s brickwork creates a boundary between family and public life towards the street, whilst on the garden side, fluid glass walls sweep around the living spaces, embracing the house’s focal point, an olive tree. 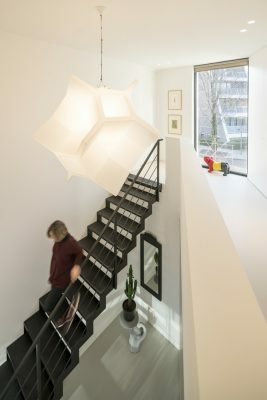 Out of sight, the home also has several sophisticated renewable energy production systems with the potential for it to become entirely self-sufficient. 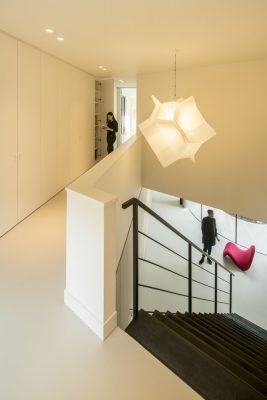 The 480m2 private home designed by MVRDV has a distinct night-daytime separation. 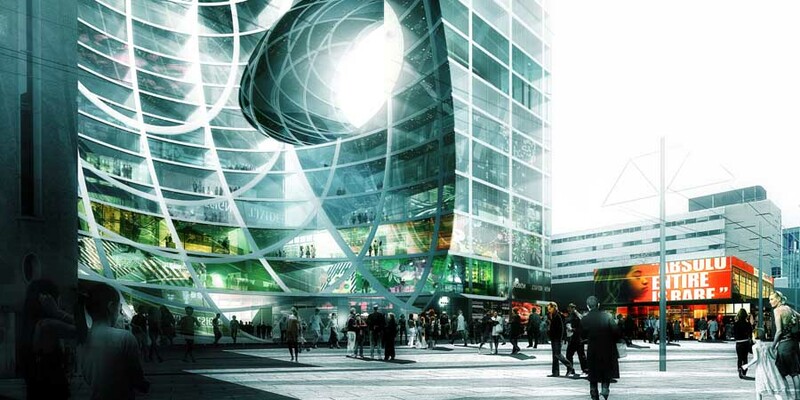 It is located in the Rotterdam area on a corner plot of the site of an old hospital. 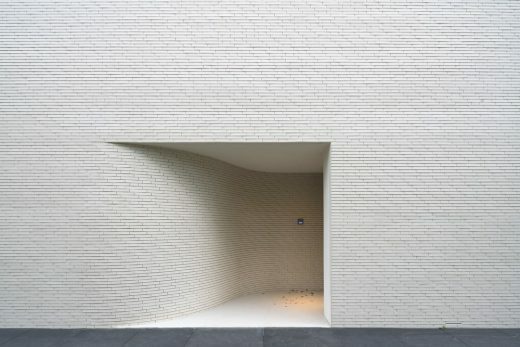 On entering through a curved indent in an otherwise flat and mysterious façade with Celosia brickwork detail, visitors are led into the entrance hall. 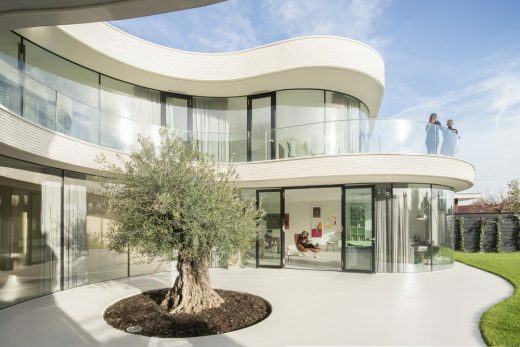 Stepping into the property, it suddenly opens into the well-lit living spaces of its curved and fluid interior. 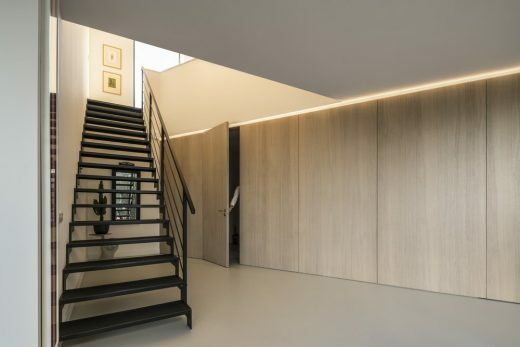 This continuous wall also serves as an entrance to the garage and staircase. 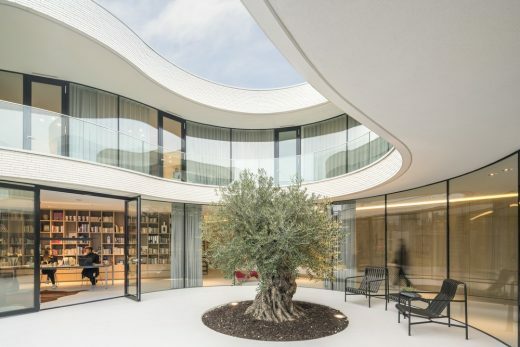 The living room and library take up the rest of the space, wrapped around a curvaceous and carved out courtyard that frames the focal point of the house, the tree. The living room’s backbone is a long fitted closet of wood hiding all domestic functions including the basement, entrance, guest toilet, kitchen cabinets and pantry. 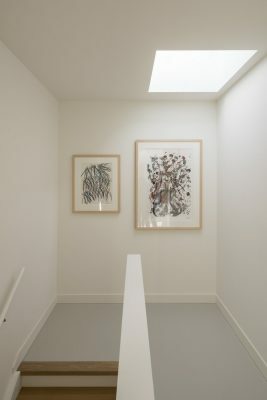 The flooring from inside continues outside and essentially turns the courtyard into an extension of the house i.e. as an exterior room. 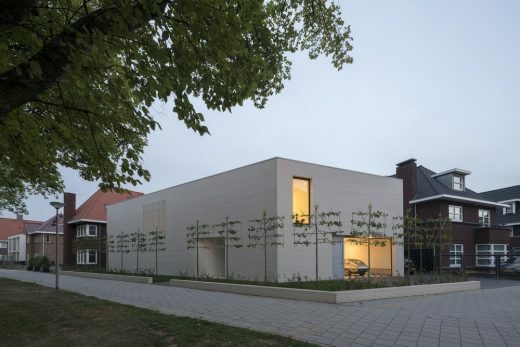 There is a small basement for extra storage, and in addition, a sun trap patio at the bottom of the garden which provides an extra paved barbeque space for Dutch summer days. “The curved glass continuously wraps its way around the interior façade on both levels creating continuous views from one room to another. As well as a visual connection, an exterior balcony also creates the opportunity to easily walk from one space to the next without disruption. 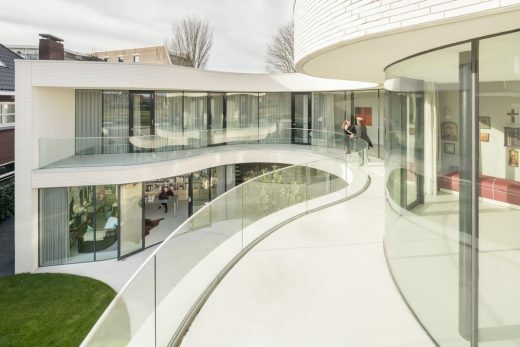 The glass reflections of the central tree continuously change and bounce around as one moves throughout the house and changes their perspective”, says MVRDV co-founder, Jacob van Rijs. In order to maintain a responsible environmental footprint, the house has discreetly installed a ground source heat pump, heat exchange system and a roof with solar panels. The solar panels compensate for energy lost from the house’s glazing producing enough energy for it to run entirely on electricity. Casa Kwantes has the potential to become entirely self-sufficient and these installations will be tested in the course of the next year. The living spaces absorb the most sunlight yet for summer months, they have sun shading due to floors cantilevering out slightly. 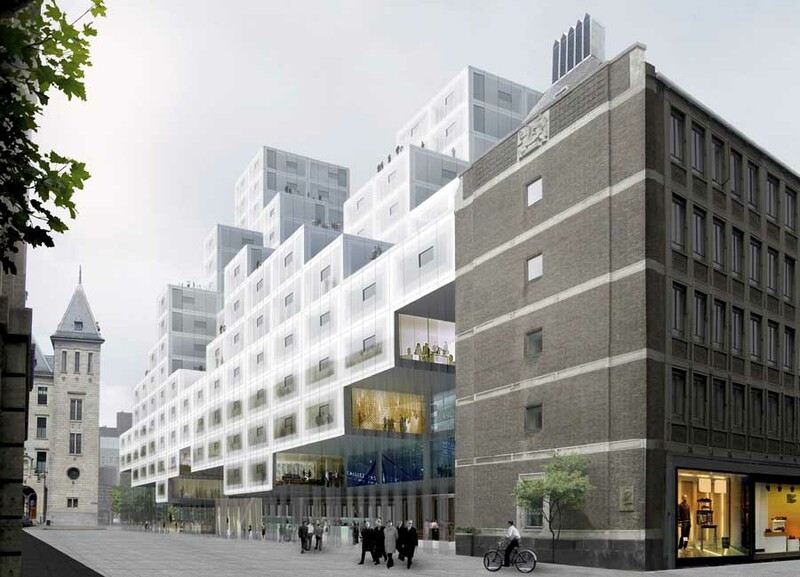 The design process of the home closely followed MVRDV’s commitment to working closely with clients throughout. With almost daily communications, the end result comes as close to a tailor-made home as possible. When balancing municipality requirements for a retro style architecture, the home became a contemporary take on 1930s modernism with its long, cream, shallow brickwork, full-height glazing, and the contrasting integration of the flat and fluid, open and enclosed, flexible and defined. As the newly built homes in the vicinity are more vernacular in their modernist approach, this variation on a more avant-garde architecture has the been subject of discussions with the municipality.